When its trendy, it looks so much more beautiful. Come on, admit it. When you see a home decor trend repeated multiple times, it’s usually because a very popular designer started it and others followed closely behind. This year also, we saw some of the most unusual and inspiring home decor trends. Spa Bathrooms have become a modern haven. Stress is a major sore point in the lives of most people nowadays. That’s why spas and relaxation places are on an all-time high. Everyone wants to relax. And where better to relax than in the comfort of your home. 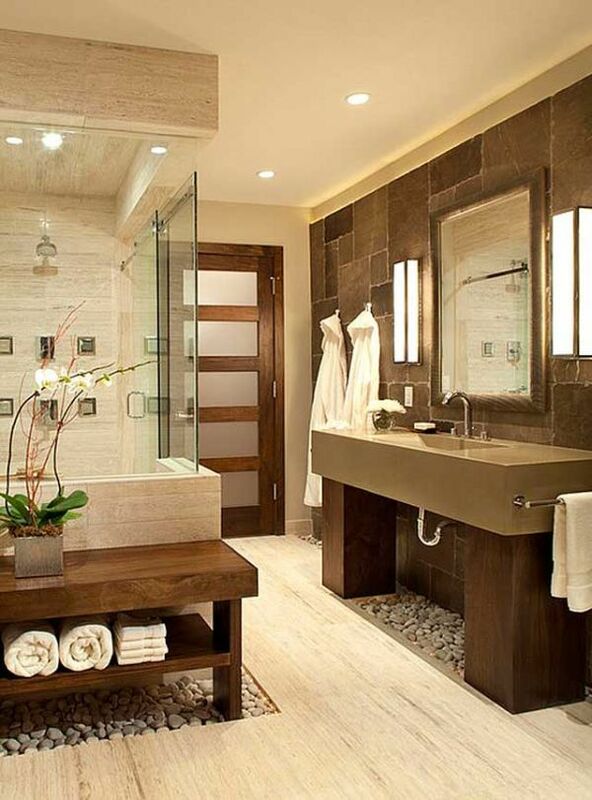 You’ll see spa bathrooms done in neutral, earthy tones. A central deep tub is the main focal point of these bathrooms. Landscaping in strategic positions completes the entire look. Before 2018, we pretty much ignored the ceiling completely. The fifth wall in our rooms is now demanding complete attention. You can do your ceiling in a bold splash of color, or add an intricate pattern to add depth and warmth to your room. If you want to really take to the next level, create a mural or even stick a plaid cloth on your ceiling. With Statement ceilings, the trend of statement doors is also gaining fervor. It’s usually the first thing your guests notice when they visit you. A statement door is the best way to get a good first impression. You can brighten with up with a bold color. Or jazz it up with big patterned plants and metallic accessories. This eclectic trend makes it so much easier to replace your fixtures and knobs. While gold and copper add a royalty to your room, silver has its own charm. Add them all in one room, and mute the rest of the colors. The shiny metals are sure to get everyone’s attention. Place in a few matte ones to make it even more exciting. Even in your kitchen, you don’t have to worry about your pots and pan not matching. It’s the in thing now. The 70s has made a comeback everywhere in fashion and art. Now it’s time for home décor. Terrazzo is texture created by adding in chips of marble, quartz, glass, granite and a few other materials into precast. You can create entire walls or flooring from Terrazzo. The Terrazzo patterns looks really stunning placed in the backdrop with some modern furniture and accessories. It brings out a whole new meaning to the look. You can either go the whole way and do an entire wall in Terrazzo or accentuate your look with a well-placed Terrazzo inspired bookshelf. The best thing about Terrazzo is you don’t have to hire an expert for that. Terrazzo is easy DIY. You can’t go wrong with it. When it comes to patterns, Herringbone and Chevron patterns dominated 2018. These simple patterns are easy to copy and they add dimension to your home. It’s a classic pattern that can never go out of style. A few good places to add these patterns is to your flooring, or as a wall pattern. Plants can really add warmth and personality to any room. With patterned plants, you can give your favorite room an exotic feel. Some of my favorite patterned plants are Calathea plants, Prayer plants, Variegated Pothos, and the Rattlesnake plants. You can add them to your entrance or add some on your window sill. Painting are always one of the most appreciate wall décor. In 2018, things took a big turn as wall art was blown up. The small gallery of art style is pretty much out. A big wall art adds value to any room. It makes it look expensive. With a wall art, it’s usually hard to tell if it’s an expensive piece. This means you can get away with a lot if you choose your wall art carefully. Big Wall Art is also becoming quite popular in children’s rooms. A nursery mural can really set the mood for the room. Move in some nursery furniture. Voila! Your nursery looks perfectly designed! Ready for the big home renovation of your life? I would say go for it! Your home should a space for peace, calm and beautiful aesthetics. We are also dying to copy at least one, two or all of these home decor trends. If money’s an issue, you can always go for home loan. Believe me, it’s worth it. Imagine you could be saving hundreds, even thousands, of dollars of your spa money. But before you apply for a loan, always check your credit score. A score above 700 is generally quite good. But if it’s below 300, you can work on improving your score. Click here to learn more on how to improve your credit score to easily get your home loan approved easily.